We are now offering four 22′ South Bay pontoons equiped with 115HP Evinrude E-TEC outboards, stereos, ski-two bars and boarding ladders. These are extremly nice rental boats. These are great for pulling tubes or skiers. 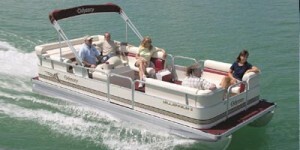 One of these is also equiped for fishing with two fishing seats, livewell and a depth finder, and rear boarding ladder. We offer both daily and weekly rates. Make your reservations now because the dates are filling up fast. A $100.00 dollar deposit is required on all weekly rentals. This deposit is NON-REFUNDABLE. All rentals are for Long Lake, Washburn county ONLY. Also you can book a boat for the next season at this years rates. This will first be offered to the renters who currently have the boat for that week.